Some internet business do deal with visually impaired customers and may lose them! Shops, banks and other businesses are turning away six million potential customers because their websites prevent disabled visitors from accessing them fully, according to BCS charity AbilityNet, which advises on IT to support disabled people at work and at home. "When we look for information, services or goods online we are not seeking a life-changing experience but speed and efficiency," said Robin Christopherson, web consultancy manager at AbilityNet. "Accessible sites are easier to use for everyone. Research by the Disability Rights Commission shows that able-bodied users find sites designed for access by disabled people are 35% faster and easier to use. Some retailers offering different versions of their sites for disabled and non-disabled people report big demand for the more accessible versions from all types of customers." Christopherson, who is blind, has led AbilityNet's regular studies of websites of companies ranging from banks to supermarkets and airlines, and the results have been consistently disappointing. The latest survey, of 10 telecoms services, gave Onetel and Kingston Communications four stars out of five Ð only the second time in eight surveys that any sites have gained four stars.Indeed, AbilityNet's results support a Disability Rights Commission study of 1,000 UK sites which found 81% failing basic accessibility tests. Yet meeting the needs of visitors with various impairments can be quite simple, Christopherson said. It boils down largely to thinking about users rather than clever design.Sites with moving images such as Flash movies can lose potential business from those who cannot use a mouse, have a cognitive problem such as epilepsy, or are visually impaired and use speech output, Christopherson said. He said research shows that web users look at text more than graphics in any case.Text size on some sites is hard-coded and cannot be easily enlarged. Some sites carry a watermark. Both features largely rule out 1.6 million visually impaired customers.Visually impaired people depend on speech output to read text labels attached to images, but these labels are often uninformative or absent. "Without these spoken labels on graphical links, navigation for a blind visitor is guesswork," Christopherson said.Pictures of text are often used instead of text. This means visually impaired or dyslexic users cannot modify the size or contrast, and, again, if the content is not labelled it cannot be read by a screen reader. Companies cannot afford to continue with inaccessible web design, Christopherson said. "Inaccessible sites exclude a potential UK market of 1.6 million vision impaired users, 1.5 million with cognitive difficulties, 3.4 million with disabilities preventing them from using the standard PC set-up easily, and millions with dyslexia or literacy difficulties, not to mention increasing numbers of elderly users. Their total spending power is estimated at £120bn a year. Companies ignore this market at their peril." Special Education Unit of the Ministry of Education recently held a workshop on the use of Braille Code for eight visually impaired students and their parents. The course was conducted by 12 teachers and led by coordinator Cikgu Haji Roslan bin Haji Zulkefli (photo). Among the objectives of the programme were to expose the use of Braille Code to visually impaired youngsters, their parents and teachers and to raise awareness of the code among public members. A specialist walking tour operator has teamed up with a leading charity to provide walking holidays in Europe for the visually impaired. Waymark Holidays, one of the UK’s leading Europe walking tour companies is working with disability charity Vitalise to offer walking tours in Austria and Spain this year for visually impaired clients.The trips, which this year are to Trins in Austria and Sierra des Mamblas in Spain, involve easy to moderate walking at the standard grades offered to all Waymark clients, with groups consisting of 16-22 clients with a helper each and two guides. Managing director for Waymark Holidays Neil Saunders said the company had been offering such tours for over ten years and the scheme has proven a success for all involved.“It is well known that visually impaired people have heightened senses, so the trips have been chosen to capitalize on their enhanced sense of smell, taste and hearing, while giving them the chance to get out and walk in some of the most beautiful areas in Europe,” he said. Vitalise Holidays aims to contribute to the well-being of visually impaired people by giving them access to a wide range of specialist holidays, both in the UK and overseas, and is very pleased to work alongside the team at Waymark,” he said.The next trip on offer for Vitalise Holidays’ clients is Sierra de las Mamblas from 22-29 October, walking along old pilgrim routes across the hills to ancient hermitages, villages and monasteries. It is based in the historical town of Covarrubias with ensuite accommodation in a comfortable hotel. Pony rides, slides and clowns entertained children yesterday at the annual Apple Day Festival/Family Fun Day, while the proceeds will assist those with visual impairment. The Blauvelt Lions Club's event in Flywheel Park aids Rockland-based charities that assist the blind and visually impaired. "I'm so happy to see a lot of children," said George Griffith of Blauvelt, president of the Lions Club. More family-oriented activities and vendors were added this year, he said, "and hopefully that will translate into increased amounts to go towards Blauvelt Lions' charities." Griffith said that the Lions hoped to raise up to $5,000 with this year's event. Money came from food sales, with all items donated by ShopRite in Northvale, N.J., Griffith said. Ride operators contributed half of the money they took in. For many, these rides were the most exciting element of the day. "I played on the slide," said 5-year-old Adam Koljenovic of Orangeburg. "I played on the horses and they were fun." Jim Walsh, 36, of Pearl River was enjoying the day with his wife and children. "We've just been walking around and looking at all the rides," he said. "We're having a good time." Lions Club International has been aiding the blind and visually impaired since Helen Keller called upon the group for aid in 1925, and Griffith pointed to other aspects of the group's charitable work that benefit the greater community as well. This work includes the creation of the Blauvelt Lions Park, which was dedicated in June. The group also obtained a $75,000 grant last year from Lions Club International to develop and equip a Low Vision Rehabilitation Resource Unit within Dominican College's new $12.8 million health and science center. "We support a number of charitable enterprises," Griffith said, including aiding victims of the December 2004 tsunami in Southeast Asia. Does a person, who could once see and then has lost the gift of sight, still dream? This was one of the many questions that was put forward to Joyce Kane, president of the Southern Connecticut chapter of the National Federation of the Blind by the students of the Blind Boys’ Academy in Kolkata. Kane, who became visually impaired due to high diabetes, was in Kolkata today to visit the Blind Boys’ Academy and to speak at a workshop of the National Association for the Blind (NAB) at the American Center. Notwithstanding an initial bout of frustration on having lost her vision, Kane chose to lead a ‘‘normal’’ life. Her guide in the journey of her life is her dog, Corey. With Corey guiding every single footstep of hers, Kane is touring India in an effort to, in her own words, ‘‘set an example of what a blind person can do’’. On her visit to the Academy, Kane interacted freely with the students and patiently answered their queries about the emotions of a person who was not born blind, but had lost her vision. The seminar that she subsequently attended dealt with the issue of Disability Rights. Among Kane’s plans are the creation of an awareness about the needs of the visually impaired and the need for Disability Rights. ‘‘Disability Rights in the United States has helped me lead a normal life,’’ said Kane. 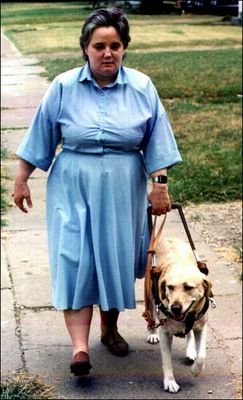 Using herself as an example, she also plans to educate people about the use of guide dogs. Although India has an estimated 14 million people who are visually impaired, the knowledge and awareness about using guide dogs or any other service animal is still in its nascent stages. Other speakers at the seminar included Kanchan Gaba, a visually impaired advocate who had been discriminated against and therefore could not follow her dream of pursuing a career in the Indian Administrative Service (IAS). Her speech on Disability Rights in the Indian context, revealed that the most cherished desire of a ‘‘differently abled’’ person was the right to participate in society. Who says that blindness makes one handicap and dependent on others. A visually impaired family here has proved that blindness is no hindrance to success as it runs its business successfully. Two blind brothers run their grocery shops while their blind sister is working in a government school as a teacher. Where many blind people have shrugged off their life in the dark, Dharam Chand is leading a respectable life by running his own grocery shop. At a small distance from Dharam Chand’s shop, there is another grocery shop of Rajendra Jain, his brother. “I am blind since childhood still I run a grocery shop and feed my family. I do all the purchasing by myself, sell the products and run my shop smoothly. Till date I haven’t received any any help from the government,” said Rajendra Jain. While describing the shop, customers said they have never been supplied with wrong orders. “For the past 10-15 years, I had been purchasing things from his shop. I haven’t faced any problem so far. We get what we order. Not only me but other locality people also purchase things from him,” said Dinesh, a customer. Nirmala, Dharam Chand and Rajendra’s sister, who is also visually challenged, completed her graduation, B.E.D and got an employment as a teacher in a government school. “I suffered blindness when I was 14-15 years old but I never bothered my parents. For the past five years, I am working as a teacher in a school. I do not even face any problem in carrying out my household work. I feel, despite blindness when I can execute all my activities, other blind people can also do the same,” said Nirmala Jain. These physically challenged people have set an example for other visually challenged that they can also lead their lives with respect without depending on others. THE UT police have spread more darkness in the life of a visually-impaired man, who is knocking at the Sector 11 police station’s doors for the last 11 days with a hope to get help in finding his allegedly kidnapped wife. However, the UT Police, which did not even register a case on his complaint, kept on lying to him that they have taken action and even interrogated the accused. Kunji Ram, a clerk in the Animal Husbandry Department (Punjab), with the help of a stick guiding his way, approached the Sector 11 police station on August 8 evening and lodged a written complaint saying that he was suspecting that his wife Nirmala Devi has allegedly been kidnapped by Khuda Lahora resident Surjit. But the police personnel allegedly refused to take note. Harassed, Kunji Ram approached an advocate, who charged him Rs 1,200 for getting his case registered. Because of the advocate’s intervention, the police received a written complaint from Kunji Ram and mentioned it in their Daily Diary Register. Period. Since August 8, he has been daily visiting the police station in vain. Kunji Ram married Nirmala Devi in 2002 in Rohru district. She gave birth to a baby boy in 2004, who died after 15 days of birth. “Since then, Nirmala remained depressed, but had never fought with me on any other issue. During the past few months, I had suspected that she had developed some intimate relations with Surjit. I even caught her and she apologised. I feel that either Surjit had been blackmailing her or kidnapped her. I want my wife back. Isn’t this the responsibility of the police to trace her?” he said. The free mail service, for books, letters and other print material is an extension of the company's "Articles for the Blind" postal service. The UK-wide scheme delivers specified items - such as talking books and white sticks - free of charge, for those registered blind or partially sighted. Seven million items are sent each year under the scheme, which began in 1906. The items must be labelled "articles for the blind" to qualify for the concession. Royal Mail product manager Sharon Palmer said: "Royal Mail has offered a special service for blind people for nearly a century and is proud to do so with its unique access and reach to the UK's 27 million addresses." The extended scheme was developed in conjunction with the Royal National Institute for the Blind (RNIB). Technology made available to the visually impaired! A WHOLE new world has opened up for Kalpesh Rawal and many others like him. A visually impaired student, he was facing a tough time keeping himself abreast of the latest in the world of information technology as the audio cassettes and Braille books provided by Blind People’s Association were just not enough. But ISRO’s EDUSAT project will help him envision his future and prepare him to reach his goals. The unique network configuration developed by ISRO will help deliver live audio for blind students and even enable the transfer and printing of audio data files with the help of Braille printer. This will help supply of the latest information in the form of data files to the students, which can be referred whenever required. The network functions in two distinct but independent modes — data broadcast and audio broadcast. In data mode, the sender’s (teacher) instructions are automatically stored in a file at each and every receiving unit (classroom) through the User Datagram Protocol (UDP) mode. While in audio mode, live audio instructions are transmitted to the students. For the initial phase, ISRO has set up one transmitting end at the BPA Vastrapur and 10 receiving ends across similar institutes in Bhavnagar, Jamnagar, Sayla and other places. The network will be inaugurated on August 30. In the second and final phase, 15 more institutes will be connected through this transmitting end. EDUSAT is primarily meant for providing connectivity to schools, colleges, and higher levels of education and also to support non-formal education. Art Exhibition open to visually impaired artists! Furthering its mission to help visuallyimpaired individuals achieve dignity and independence in every area of life,Chicago's Guild for the Blind announces its Fourth Annual Passionate Focus --A Juried Exhibition of Works by Artists who are Blind or Visually Impairedwill be held at the famed Fourth Presbyterian Church located on North MichiganAvenue at Delaware Place and Chestnut Avenue September 15 through November 13,2005. Beautiful works of photography, sculpture and painting created bysixteen visually-impaired artists ranging in age from 37 to 72 will be ondisplay -- proving that artistic vision doesn't require 20/20 vision. A special opening night fundraiser to benefit the Guild for the Blindprograms is scheduled for Thursday, September 15 from 5:00 to 9:00 pm in theGallery of the Fourth Presbyterian Church. Admission is $100 per person andtickets can be obtained by contacting Cheryl Megurdichian at the Guild at312-236-8569; or at the door upon entrance. Patrons attending the opening-night fundraiser will be able to participate in an auction for the displayedartwork. Sold artwork will remain on display until the exhibit closes onNovember 13. Art not sold at the auction will continue to be for sale duringregular gallery hours through November 13 -- Wednesdays through Saturdays11:00 a.m. to 4:00 p.m. and Sundays 8:00 a.m. to 6:30 p.m. The gallery isclosed on Monday and Tuesday. "The Guild for the Blind's mission is to instill or restore our members'confidence and a sense of dignity, helping them believe in themselves in everyarea of their lives, whether at home, work and/or in the creative realm," saidDavid Tabak, Guild for the Blind executive director. "Most of the Guild'sstaff and volunteers are themselves visually impaired and are dedicated tohelping adults throughout the Chicago area learn to use a computer, findmeaningful employment and adjust to vision loss both inside and outside of thehome. Passionate Focus is a reflection of the spirit embodied in all theprograms we offer at the Guild. Simply, if people who are blind can beartists, what else can they do if given the opportunity and support?" The artists' work included in the show was selected by a prestigious jury,including Hyde Park Art Center executive director Chuck Thurow and nationallyrecognized artists and art professors (at Indiana's Northwest University andUniversity of Illinois Chicago respectively), David Klamen and Tony Tasset. More than 35 artists from the U.S. and abroad submitted artwork for thisyear's Passionate Focus. Pieces were selected based on criteria set by thejurors and include acrylic and oil paintings, photography, ceramics and othermedia that portray landscapes, city views, fanciful illustrations and modelautomobiles. While choosing artwork, jurors were not told of the nature andextent of the artists' vision loss-rather each piece was judged solely on thesame merits as those of sighted artists. Passionate Focus was the inspiration of a visually-impaired staff memberat the Guild, Judi Jasek. Judi, who passed away several years ago, was anartist whose work was widely exhibited and was an inspiration to the hundredsof lives she touched. Passionate Focus is a success for two distinct reasons.While encouraging artists who are blind or visually-impaired to answer theircreative callings, Passionate Focus also educates the sighted community on thegifts and abilities of those who are blind or visually impaired. Maxi-cam enables the visually impaired to see! Ann Lynch couldn't help but break down and cry.A device the size of a computer mouse had just worked a miracle for the nearly blind Fremont woman. It allowed her to read for the first time in four years. "I got on the phone with Bea (Jorn) and cried for a couple hours. I said, 'I'm reading, can you believe it?'" Lynch said.Lynch wasn't alone in her joy.Blanche Bloemker, a fellow member of Fremont Pathfinders Visually Impaired Peer Support Group, also has benefited from a visual aid known as a Maxi-Cam. The magnification device has helped Bloemker read the daily newspaper and complete other book work because she can now see the numbers.As Bloemker moves the device over a series of text, it shows up magnified in black and white on a nearby television screen. A knob on top allows her to zoom in and out. The camera can magnify up to 24 times. "I can still see with my magnifying glass at home some, but not like I can with this," Bloemker said.Besides being able to read a newspaper, book or magazine, the Maxi-Cams also have been a blessing for group members who take medications. The small, but very important, information on a medicine bottle can now be read. "We can actually read our own directions," Lynch said. "I didn't know that they had started putting the cautions on the side of the bottle. "Prior to using a Maxi-Cam, Lynch required hospitalization after she accidentally overdosed on her prescribed medications because she couldn't read the bottle labels. "I thought I was taking my heart medication and I was taking extra blood pressure medicine," she said.Putting on make-up also is possible with the camera. To put on lipstick, the user would hold the camera near her face while following the magnified picture. Lynch, president of the Fremont Pathfinders Visually Impaired Peer Support Group, often travels to functions for the organization. The small size of the Maxi-Cam has allowed her to carry it with her on the trips. "I can just put it in my purse and hook it up to a TV or a computer monitor wherever I'm at," Lynch said.The local support group purchased three of the Maxi-Cams through a grant from the Fremont Area Community Foundation and the Lester Walker Fund. The group has received money to buy six more devices if the need arises.At $300 each, Lynch and Bloemker believe the Maxi-Cams are a bargain. "For $300, to be able to read a newspaper article or see a picture of your grandkids, this is great," Lynch said.Of the 46 chapters of Visually Impaired Peer Support Group in Nebraska, Fremont's group is the only one to have the cameras.Lynch estimates between 200-250 people who live in Fremont are visually impaired. But the local support group only averages about 16 people for its monthly meetings, something Lynch would like to change.One of the many benefits of the support group, Lynch said, is locating visual aids that can help people in their daily lives.Many aids can be found throughout Lynch's home. She has a talking watch and clock and a timer with Braille she uses for cooking. Lynch also is diabetic so she utilizes a talking glucometer to test her blood sugar levels. "There's a lot of visual aids out there," Lynch said. "There's a lot of people just here in Fremont who would benefit from our group and benefit from the visual aids ... We're here for each other. "The support group meets at 1:45 p.m. the second Monday of each month at Gifford Towers Community Room. A business meeting is followed by a program.Persons don't have to be visually impaired to join the group, though. Bea Jorn, the group's secretary, isn't visually impaired but attends meetings because her husband has macular degeneration. Art seen through the sense of touch! Seeing with their hands -- that is what young visually disabled artists did to create works for an ongoing exhibition at Gallery Tom. A sculpture of a woman walking with a guide dog is displayed at an exhibition featworks created by children with visual disabilities at Gallery Tom in Tokyo's Shibuya Ward. Located in the quiet Shoto district of Shibuya Ward, Tokyo, Gallery Tom is the only art gallery in Japan that caters to the visually impaired by letting visitors touch the displays. This summer, the exhibit "Boku-tachi no Tsukutta Mono 2005" ("The Things We Made 2005") features about 60 works made by children at schools for the blind from around Japan, including Tokyo and Hokkaido, Gifu and Fukuoka prefectures. Most were ceramic sculptures, including a bowl of "udon" noodles with delicately made leeks and shiitake that looked good enough to eat, and a bunch of fresh blue hydrangeas that brightened up the gallery. A first-year high school student in Fukui Prefecture sculpted a woman walking with a guide dog, stating in her explanation for the work that it portrayed her ideal self at the age of 20 -- walking smartly around town. "It does not matter whether a person can see when creating art," gallery director Harue Murayama said. "Art is created through sensitivity, not vision. That is how everyone creates art." Murayama and her husband, Ado, established the private gallery in 1984 after their visually impaired son, Ren, said that "even blind people have the right to see (Auguste) Rodin." Since then, Gallery Tom has held countless exhibitions that let visitors "see" art through their sense of touch. Her son, however, passed away in 1999. "At that point, I felt I couldn't go on," said Murayama, whose husband died in 2002. "But I realized I had to continue (this work) because I wanted to leave something in this life -- just like my son and my husband did." With this renewed burst of energy, Murayama continued holding exhibitions, symposiums and lectures by artists to educate visually impaired people in art. This exhibition, which included artworks by students from elementary school to high school, has been held periodically for a decade, but this year's is a special treat, Murayama said, because the works are expected to be included among a set of pieces to tour Spain, thanks to the Organizacion Nacional de Ciegos Espanoles (ONCE). This national association for the blind was launched in 1938 to give social and financial aid to blind people. It organizes a lottery -- an operation that employs over 23,000 blind or disabled people -- and has been actively involved in promoting blind artists and helping young visually impaired people receive education. Murayama said that, thrilled as she is with the invitation from the highly profitable association, she is utterly disappointed Japan does not have a similar support system. "In a way, I am acting against all forms of discrimination," Murayama said. "But if you stop and think for a moment, you will realize that what I am doing is a matter of course. . . . If people realize that (a person with a disability) is just the same as any other person, there would be no need for me to take such action." When someone is visually impaired, if often indicates that either they have good vision in certain areas or poor vision in general. For example, a visually impaired student may have a 20/20 vision in spots, in front of him only or in his peripheral vision only. To be diagnosed as legally blind, you must have 5% or less vision as vision impairment indicates important visual problems that will prevent you from doing activities with adaptations, resources or help. Because of his visual impairment, your student may not be aware of foreign objects or other dangers that could affect his eyes. This is why glasses are important while inside a building as a protective device. Usually they have no prescription as the role of eye glasses is not a corrective one as it usually is with other people. Outside can also affect negatively your visually impaired student. Such things as: UV rays, insects, debris, bright lighting, rain, wind and glare will have negative effects on your student as well. Your student has enough problems as it is with his vision without adding to it. UV rays affect anyone's eyes regardless of the quality of their vision. Rain and wind will create teary eyes and insects or debris either infection, irritation or even damage. Bright lighting and glare will also affect your student's vision even more than you. You see, the worst their vision, the more blurred it is and the more contrasts will be important to him. If there is bright lighting and glare, the contrast will be changed and he may not see the shadow of an obstacle that because of this situation he may not be able to avoid and even get hurt in the process. Also, especially in a classroom, some students may have the bad habit of throwing things in the garbage for example. Well, if it comes in your visually impaired student's way, he will not be able to protect his eyes so the glasses will help to protect them. Outside, students play ball games and while sunglasses may not prevent him from getting hurt at all, it will protect his eyes. Here is a link that I know will be useful to your visually impaired student's parents as they will be able to select the type and browse some sunglasses of recommended online stores: http://sunglasses.findoutnow.org . Take a look yourself, you could be surprised by all the information that you could find there. A guide dog, is someone's eyes...please respect the fact that when the dog wears its harness, it is on the job...the safety of his owner depends on it. Here are a few important tips that anyone that surrounds your visually impaired student should know when if a visually impaired student uses the services of a guide dog. The life of your student may be at risk otherwise. If the guide dog is wearing a harness, do not pet it as it is on the job. The safety of its owner depends on the alertness and reactions of the dog. Always introduce yourself to its owner first and ask if you may pet the dog but only when the dog is free or wearing a regular leash. If people start petting the dog even when it is lying down, the dog who has been well trained, might develop not be as alert or on task and may be responsible of getting its owner into a bad situation. When the dog is wearing a harness, petting is not the only thing that you should not do. Do not feed, play or even talk to it otherwise he will focus on you instead of his job. You should know that the guide dog is allowed anywhere and anyone who refuses the entrance of the premises of the dog can be in a lot of trouble. The guide dog is someone's eyes, it is not a companion or a regular pet. It should be treated as a tool, not as an animal, by the owners of public places. If one of your student has allergies to dog's hair, ask your administration for making some special arrangements as like your student with an allergy, your visually impaired student has rights as well. Refusing the attendance of the dog is not an option and in such case, human rights and other recourses are available to remediate the situation. At the beginning of the school year or upon the arrival of your student and his guide dog, introducing himself and the dog may be a way to explain how to react towards the dog and why it is important to follow these guidelines. Also, taking off the harness to allow the students to pet it for a few minutes may satisfy their need of petting it when wearing its harness. Always allow your visually impaired student and his dog enough space for the dog to lie down safely and not too close to the walking path of students between rows. Don't box your student in the corner and allow enough space between tables or desks to permit both your visually impaired student to walk safely side by side if possible. When getting ready to leave the premises for example, prior to going to the music class, state your directions out loud to allow your student to give his directions to his guide dog. Also, encourage your students to allow your visually impaired student to either go first or last to facilitate the exit of the class. You should also instruct your student to inform your visually impaired student prior to a situation where he could obstruct his way by going in front of him for a reason or another. Always allow your student a place where to put a bowl of water for the dog and give him some time to go outside for a walk with the dog. Depending on the age of your student, you may prefer to have someone else accompany your student. If you follow these simple guidelines, you can be sure that no problems will arise, risking the safety of your visually impaired student.